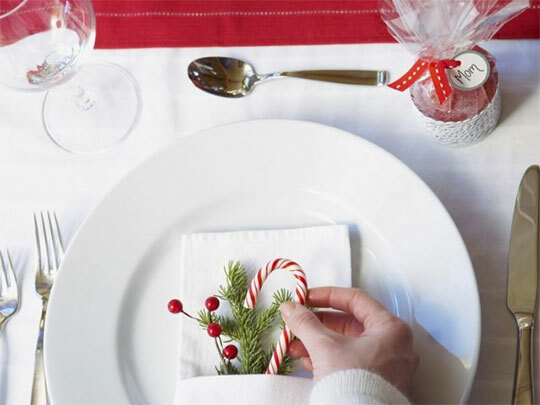 Christmas table decorations satiate guests’ visual appetite and set the tone and mood for your Christmas dinner, even before everyone sits down. What will you create this year? 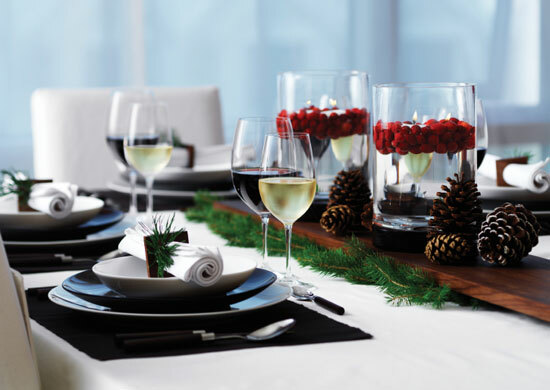 With an atmosphere of joy and celebration (and presents) in the air, the communion of family and friends over a Christmas meal is eagerly anticipated. There are so many options to choose from. First decide on the mood you would like to create. 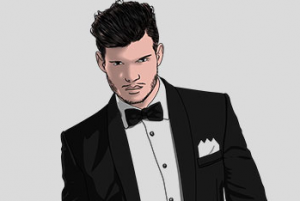 Are you going for a formal, smart or relaxed affair? Guests will feel this as soon as they walk in the dining room. 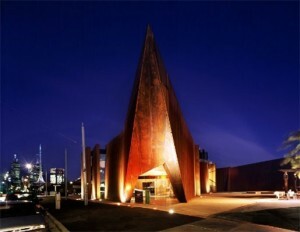 Do you want elegant sophistication or the natural look? How about colour? Planning ahead will help ensure that you start your Christmas party with the right tone, no matter how it ends! 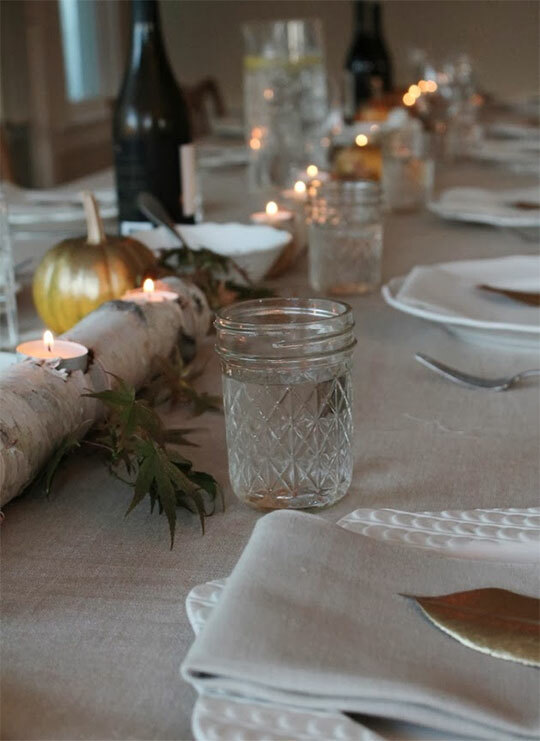 The use of mason jars filled with salt or sand with berries and pine needles brighten up this table. Hazelnuts or pistachios can also be used for a natural look. Simply making a timber box and painting it white sets the boundary for the masterpiece of this decoration. Fill with fern and a few juniper berries. Use candles as a centrepiece for added atmosphere. 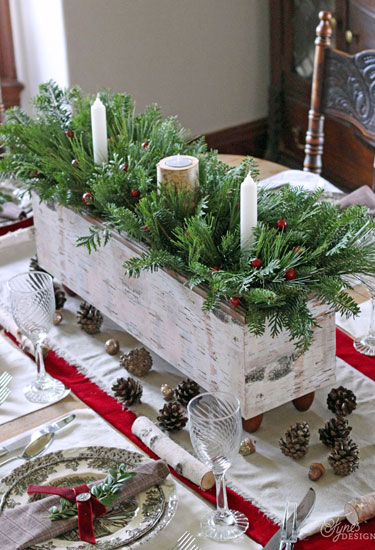 The timber box can be recycled and used as a table decoration throughout the year. Only a small amount of handiwork is required to create these silver pine cones. Simply collect some pine cones, and spray with silver spray paint (you may want to protect your surface with newspaper). Name tags add a personal touch to each setting. White theming with a sparkle of fun. 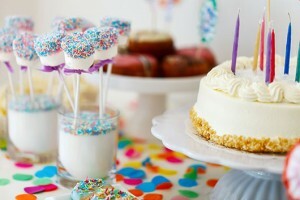 A peppermint cane and small basket of lollies help add colour and gifts as well as placing who sits where. Add some greenery and berries and you have a simple and cost effective setting for your table. Green and red are the universal Christmas colours, but you don’t have to use tacky green and red tinsel to incorporate them into your table decorations. Living greens growing in pots bring the elements of nature indoors, and red fruits and candles add the rustic finishing touches. A power drill and some branches is all it takes for rustic candle holders. Place the branches in a vice and measure the depth of candle holder before drilling into each one. 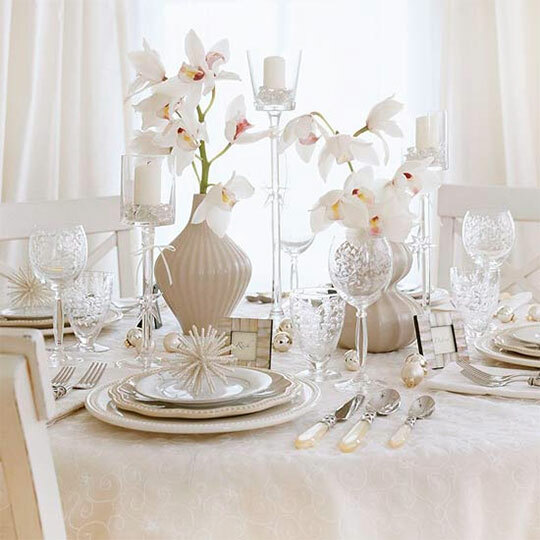 Glitter and gold highlight the table settings and bring elegance to the fore. 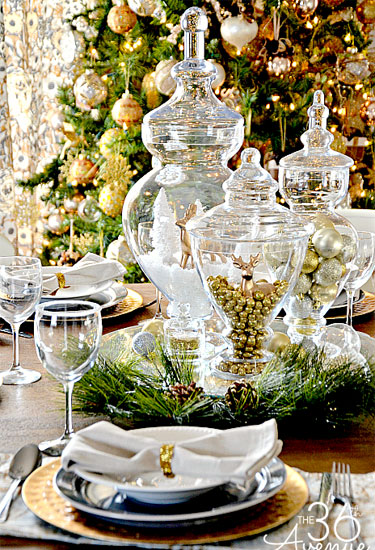 Choose small decorations in glassware as the centrepiece. A gold napkin ring on white napkin highlights the individual settings. White with hints of beige keep this setting light. 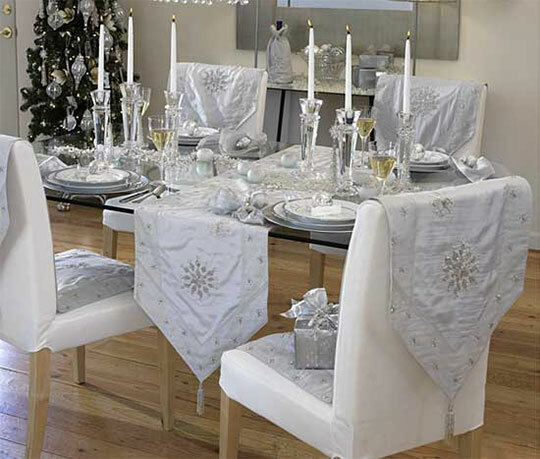 A sprinkle of white baubles on the table with a decoration on each plate represents Christmas here. Orchids look great as the centrepiece and you can use a miniature picture frame with everyone’s name in it for place holders – which then becomes a gift for them! 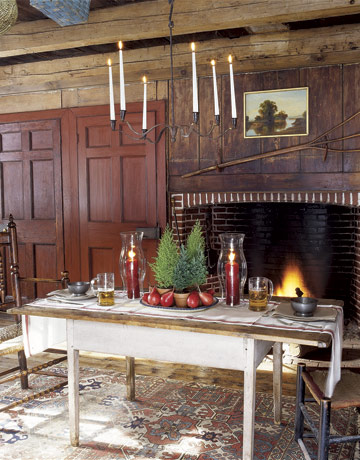 With runners over the table and chair, silver takes over the setting and brings the festive spirit into the room. The theme is matched on the dinner plates themselves, with their silver rim. 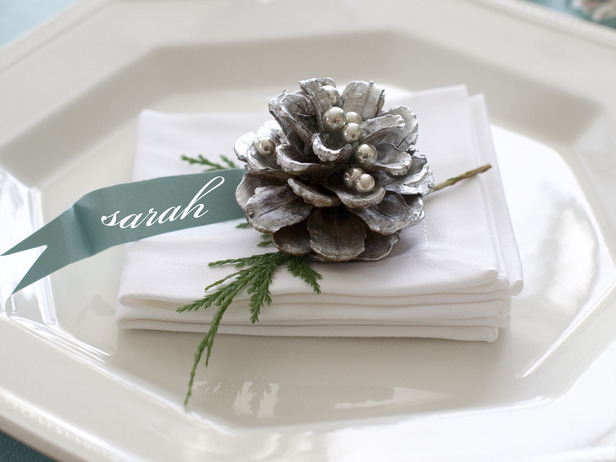 Silver painted pine cones are the feature of this simple yet creative Christmas table decoration. The hanging wreath above the table creates a beautiful centrepiece which leaves more room for dinner on the table. 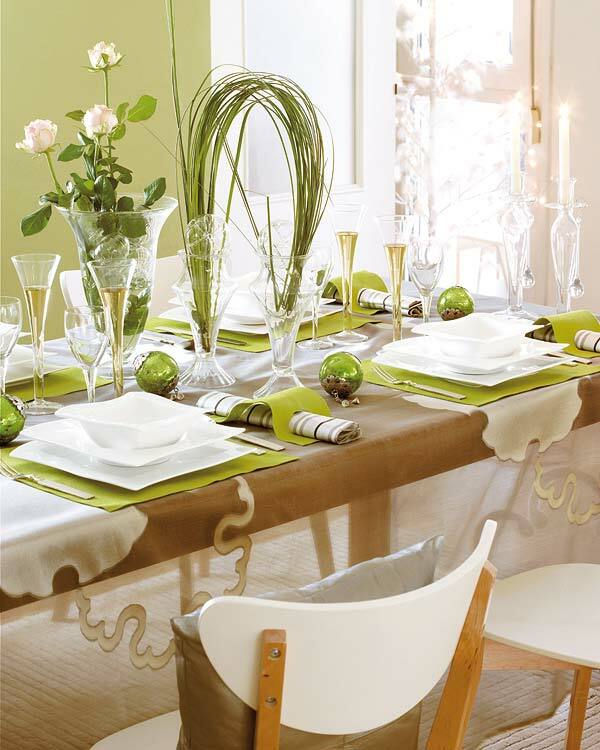 Sea grasses rather than pine bring nature inside with a spattering of baubles on the table co-ordinating colour throughout. The simplicity of neutral tones with a timber setting and candles in glasses are all that is required for this modern setting. 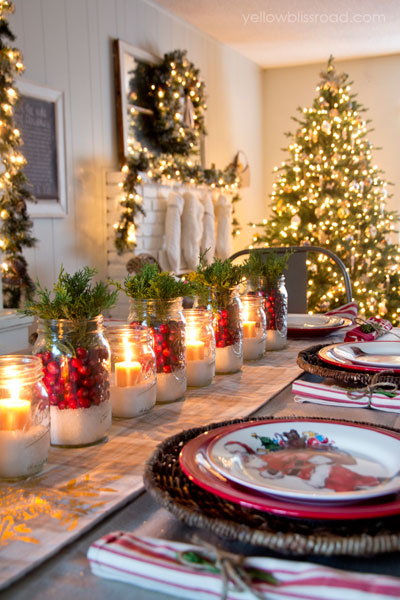 Use a few pinecones and a sprig of pine through the napkin ring to add colour to the individual setting. 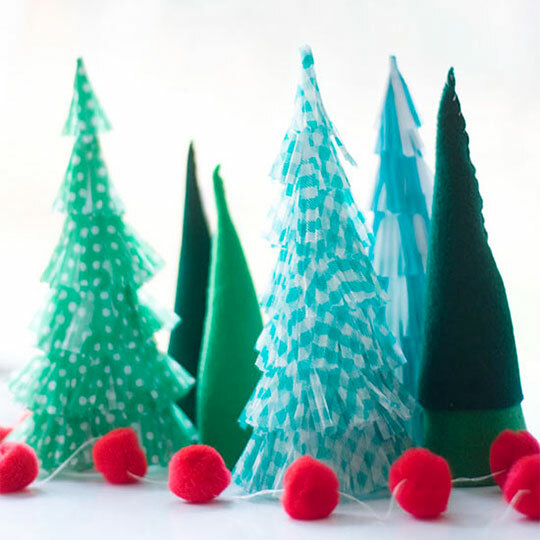 Christmas Trees – Making your own Christmas tree centrepieces is a great way to involve the children. Simply cut out from felt and glue or stitch together. Or, use paper cupcake holders and cut the edges. 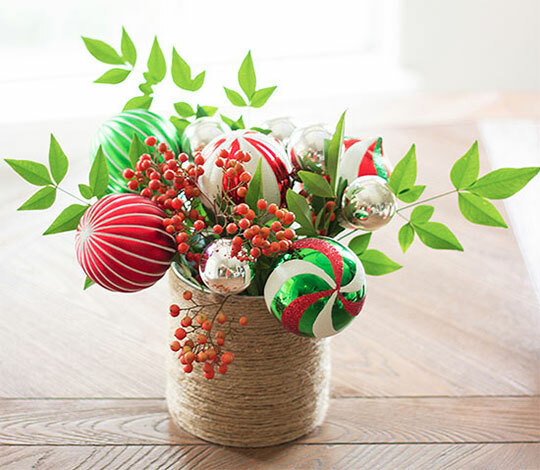 Ornament Centrepieces – Use a tin or glass jar and wrap string or ribbon around it. Glue in place. Place some foam inside the jar. Take the Christmas balls and push one end of florist wire into the decoration and the other into the foam so they stand like flowers. 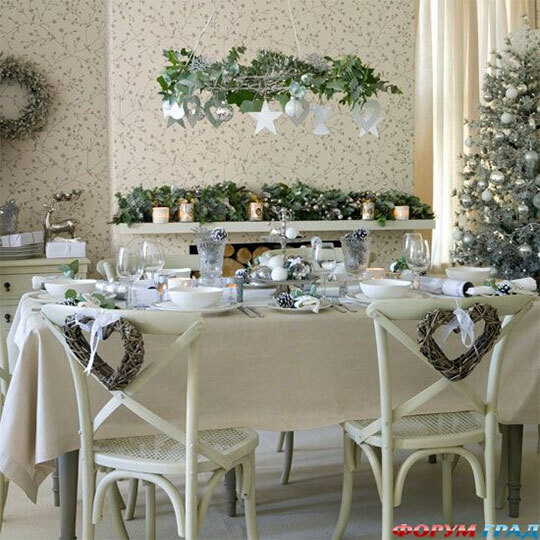 Include some greenery from the garden and berries to keep the colours of Christmas.